Died of wounds, 1st June 1917, age 29. Wilfred Owen Gibbons was the son of Richard Henry and Blanche Chappell Gibbons, and was born at Northwood, Staffordshire about 1887. He was baptised at Bucknall, Staffordshire, on August 14th of that year. In the 1881 census for England, Richard Henry Gibbons was living at Bedford Street, Stoke on Trent, as a lodger in the house of Richard Billington, a tailor. Richard Henry was 26 years old, and described as an Earthenware Manufacturer, employing 24 men and 24 boys and girls. He was single. By 1891 things were greatly changed for him. The family were found at 5, Oak Street, Hanley, Stoke on Trent. Richard Henry was 36, and a Commission Agent. His wife, Blanche Chappell was 36, born at Manchester. The children were Blanche E.M., age 10, Gwendoline M. 8, Vera Royle 7, Donald H. 5, Wilfred Owen 4, Winifred M. 3, and Cyril C de C, who was 10 months old. There was also a governess, and a domestic servant. All the children had been born in Staffordshire. In 1901, the family were living at Grove House, Wheelock, Congleton, Cheshire. Richard Henry is now a cork merchant, and the family have now been joined by Alic Howard, age 6, and Leslie Montague, 3, born since the last census. In 1911, the father is living in Stoke on Trent as a lodger, and is described as a horse corn blender, and employer. His wife, now named as Blanche de Courcy Gibbons, is living at Roughwood, Prestatyn. Also named are her sister, Georgina Clive, her daughter Gwendoline Maria Davies 28, her granddaughter Enid Nesta Davies 3,and youngest son Leslie Montague, who is 13 and at school. Blanche had given birth to 10 children in 31 years of marriage, of whom 9 were living. Ancestry probate records show that Richard Henry Gibbons died on 13th August 1914, and probate was granted to his son, Donald Harcourt Gibbons, a grocer. His effects totalled £1015 7s. Wilfred Owen was not found on the 1911 censuses for England and Wales, and the reason can be found on the website Australia – Assisted and Unassisted Passenger Lists 1839 – 1923. He arrived in Australia at Brisbane on March 28th 1911, his age was given as 23, and he had left from London on the SS Thermistocles. This ship, built by Harland and Wolff at Belfast, was launched in September 1910, and sailed the London to Australia via Capetown route. Wilfred’s service records are found in the National Archives of Australia, in fact there are no less than 62 pages relating to him, although they are not in order. On enlistment on December 17th 1915, he signed up at Longreach, Queensland, where he was working as a labourer on a station. His age was given as 25 years and 5 months, his height was 5ft 8ins, and his weight was 150lbs. His chest measurement was 34ins, 37 when expanded, his complexion was fair, and his eyes and hair were both brown. He had a tattoo of clasped hands on his right forearm. His religion was Church of England, and his next of kin was his mother Blanche, now of Powell Street, Coogee. He joined the 42nd battalion AIF (Australian Imperial Force), where his rank and number were Private 344. The AIF Memorial Project gives similar details to those above, with the additional information that he was educated at Sandbach Grammar School. Wilfred’s service records show that his unit embarked from Sydney, NSW, on board HMAT A30 “Borda” on June 5th 1916. They arrived at Southampton on July 23rd, and after training arrived in France on November 25th the same year. When in France he had been hospitalised twice suffering with gastritis. On June 1st 1917 he was wounded in action in the field, these wounds were a fracture of the skull, and a compound fracture of the elbow. He died of his wounds at the 9th Australian Field Ambulance. He was buried by Reverend B.C. Wilson on 27th June at Pont d’ Achelles, which is located 2miles NE of Steenwerck, 2miles NW of Armentieres, Nord Pas de Calais. 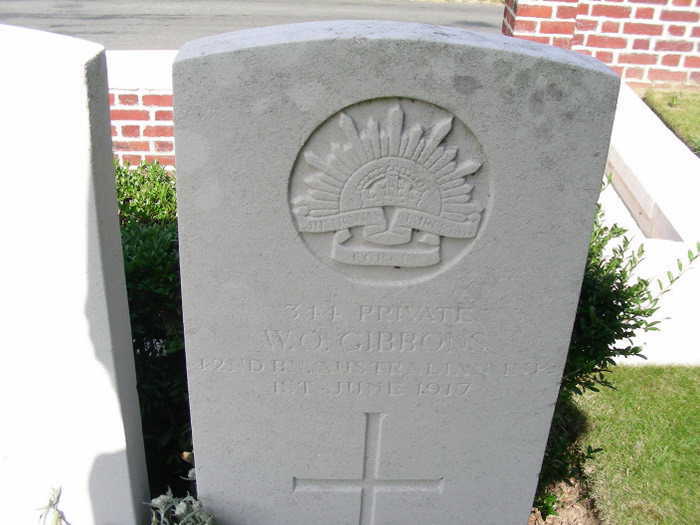 Word has just been received that Private Wilfred Gibbons, 1st Australians, late of Roughwood, Sandy Lane, has been killed in action on June 21st. 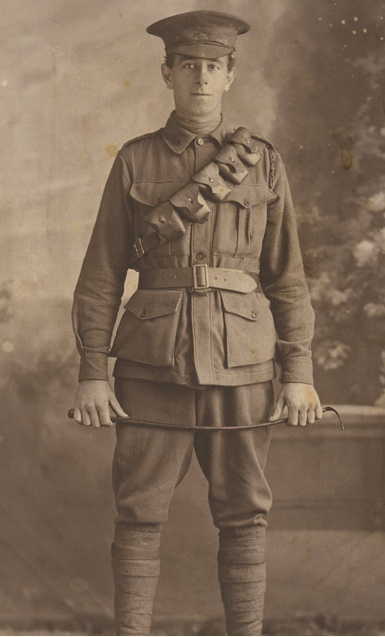 He was one of 5 brothers – all in the Army – the second son of Mrs Gibbons – now of Coogee Australia. He was 32 years of age and had been out since the commencement of war. We do not know how long it took for the news of Wilfred’s death to reach his mother, but there was correspondence from Mrs Gibbons, and from her solicitors to the officer i/c Records, asking if a will had been found in his paybook, and also asking for an official certificate of his death. She later asks for, and receives, 3 photographs of his grave, and writes back thanking them profusely, as she says she is too old to travel so far to see the resting place of her dear son. On February 26th 1918, Mrs Gibbons acknowledges receipt of one packet of Wilfred’s effects, which were sent via “Ulysses”, a troopship. The items were his identity disc, a wallet, a metal ring, a cigarette case, photos, letters, and 3 coins. Mrs Gibbons is granted a war pension of £2 per fortnight, from 19th August 1917, and as late as 1923 writes that she is “deeply grateful for the kind remembrance of the medal and scroll and the King’s letter, and that she has had them framed. Mrs Blanche Gibbons died at New South Wales, Australia, in 1942.